BILL MILLER on SPURS MAGAZINE! the Holston Conference Native American Ministries Team. The paintings behind Bill are his own work. BILL WINS THE GRAMMYTHREE TIMES! 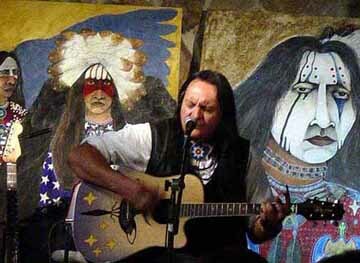 wins the 2005 Best Native American Music Album! Sacred Ground: A Tribute to Mother Earth. Hi, readers! This is an old article I wrote about Bill Miller. I'm updating my web site and couldn't bear to take it down. It's got lots of writing, many photos of Bill from The Gathering spiritual retreat and other places. Enjoy an oldie but goodie! Best wishes to Bill, his family, and everyone else! 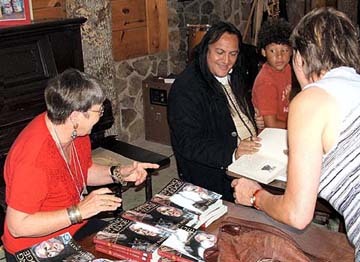 AT THE GATHERING 2005, BILL SIGNED CDS & PRINTS OF HIS ART WHILE SANDY SIGNED BOOKS! 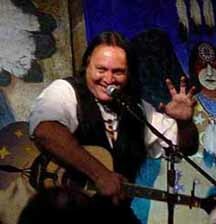 Bill Miller is the Spiritual Leader of The Gathering, a Native American spiritual retreat in Tennessee. 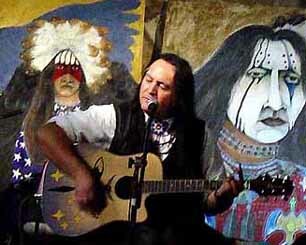 The Gathering is a great place to hear Bill speak and sing in a serene, intimate setting. Here he and Sandy Nathan sign copies of Sandy's book, Stepping Off the Edge.The book features the Gathering and Bill Miller. Bill's son, Jacob, is sitting on Bill's lap. Not seen in the picture, prints of Bill's art were for sale. INSPIRATION: Cosmic Spurs Inspired by Bill's inspirational CD, "Hear Our Prayer." ECSTASY: YOUR BIRTHRIGHT & YOUR SHIELD--RESOURCE LIST ECSTATIC BOOKS & CD's FROM AROUND THE WORLD! Includes Bill's "Hear Our Prayer" & " Spirit Rain"
BILL MILLER: THE HALLOWEEN EDITION The original article that kicked off this page. "GHOSTDANCE" My reaction to Bill's award winning CD. Click on the photo to be transported to the Gathering's web site. The Gathering is a spiritual retreat hosted by the Holston Conference Native American Ministries Team. CHECK OUT BILL'S MUSIC HERE! 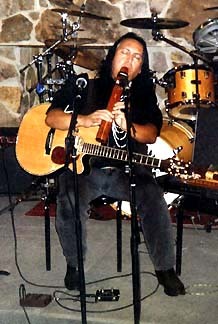 BILL MILLER PLAYING AT THE 2002 GATHERING, COKER CREEK VILLAGE, TN. This hunk of cyberspace started out as the article, "Bill Miller--the Halloween Edition." "The Never-ending Article", I called it while writing. It did end, and I think successfully. 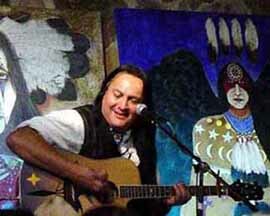 I added a blurb about Bill's new CD, "Ghostdance," just before leaving town for the Holidays in 1998. Is this page a journal? No. Too small for that. Is this a newsletter? No!!! That brings up deadlines and keeping up and making news and stuff. Schedules. Ycch! We barely get the horses and kids fed on time around here. No newsletters. Is this a cyber-altar to an adored star? No!!! Triple ycch. I hate that. People attributing perfection to mortal humans who happen to sing or dance or juggle well. No, this bit of writing isn't that, either. What is it, then? I think of this space as a writer's note to her friends. A loosely organized contemplation of Bill Miller's impact on my mind and soul. What I do these days is write and think. I'm working on a family of interrelated books -- thrillers all. While I'm writing, people, things, events, books, and music impact me. This letter lets me share the portion that intersects with Bill Miller in a way that I hope benefits all of us: you , me and Bill. I'll add new articles as events unfold. Who's Bill Miller, by the way? Some of you may not know. He's the guy in the photo above. 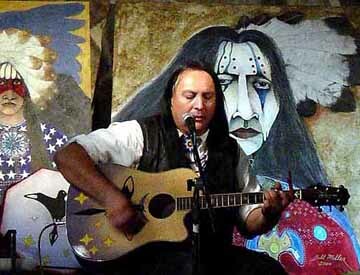 Bill is a Native American singer and musician of German-Mohican ancestry raised on the Stockbridge-Munsee Reservation in Wisconsin. My interest in Bill Miller began a couple of years ago when a CD in a Western store leapt into my hands and said, "Buy me." I did, and got knocked flat. The CD was called, "The Red Road." I found that my life and Bill's could not have been more different, or more similar. Bill Miller's music was a catalyst for me, popping up emotional business like fish jumping out of a pond. I'd listen to Bill and up would come issues that I'd have to deal with pronto or they'd start to smell. I've been a fan of Bill's ever since. Why does Bill Miller have this powerful emotional effect? He has overcome the worst sort of poverty, racism and despair. Bill Miller hasn't turned out right, given the hand life dealt him. With his background, he should be insane, a criminal, or dead. He isn't. He's a very positive, inspiring man who can fill a room with spirit and put everyone in it in touch with his or her soul. He's a devoted family man who's been married over twenty years and has five children. His music is beautiful and sweet--and he doesn't pull any punches. Miller describes the world as it is and the job before all people of good will if we are to keep our world livable. He talks about acceptance and forgiveness. Faith and hope. I have devoted this space to Bill Miller because he is an inspiration. 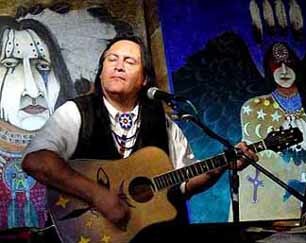 12/20/98 I received my copy of Bill Miller's brand new CD, "Ghostdance," today. Five days before Christmas. I rushed to get out of town for the Holidays, rushed to meet with our computer consultant about this site. Rushed, period. My initial reaction to the CD was, "Hummn. Humn? Huh?" The same reaction I had when my youngest daughter was born. She didn't look like anyone in either family, including me. I was certain she was mine, however, and figured we'd work it out. We did. Ghostdance struck me the same way. I was so excited to find Ghostdance among the reams of holiday junk mail that I insisted our computer consultant play it while we worked. Nathan played the CD as we attempted to untangle what I did the last time I tried updating our website. (Such as erasing all our links.) This was not a good situation to truly appreciate anything. At home, without my anxieties about computers and boy-genius computer consultants, I discovered that Ghostdance is a wonderful, wonderful album. You can order it right here. Click to Order Bill's Music. Okay. Ghostdance. I had some problems with Bill's previous album, Raven in the Snow. Parts I loved and parts overpowered me. Sort of like a bazooka in the living room. I wrote to Bill about my concerns. I felt strange writing to a public figure. Getting no response. Was I overstepping? Making sense? Did he even get my message? Did he care? Was I stupid to write? Then I heard Ghostdance . Something went "click" in my head. The album not only reflected everything I said in my correspondence, it was almost like Bill used my feedback as a guide. I know he's been working on Ghostdance for years, long before I wrote what I did, but the fit was amazing. And very satisfying. I wrote something like, "Concentrate on creating something beautiful. Let the message resonate in the truth of your heart and reach out to touch others. Sing your pain, not your anger. Make it a love song." And that's what came out in Ghostdance. The CD is beautiful. Elegant. Masculine. (Very masculine. No woman would ever write this.) Powerful. Satisfying. As spiritual as the ebb and flow of the Universe. I love the way Bill teases you with the violin prelude, then -- Wham! Slashing guitar and dark lyrics. The CD takes off instantly: A force, a power, roars through the whole thing like a freight train. That transcendent thrust, the will to live, the raw energy just keeps growing. Ghostdance's message brought two seemingly unrelated things to my mind, both worth sharing. First, Bill's lyrics remind me of the book, Independent People, by the brilliant Icelandic author, Halldor Laxness. If you're like most people, you haven't heard of Laxness. Independent People got people's attention worldwide, however, winning the Nobel Prize for Literature in 1955. (Indicating that intelligent life existed on the planet during the '50's.) Independent People is one of the most haunting, powerful, and beautiful books I've ever read. Part poetry, part fable, all brutal reality, Laxness grabs you by the throat and shoves the life of the Icelandic peasant in the early 20th century in your face. Halldor died in 1998, leaving over 60 books behind. The only difference between Halldor Laxness' world and Bill Miller's is that in Iceland, blue eyed, blond people who look exactly alike and have the same religion did it to each other. Race, color, and ethnicity didn't enter into the equation. That adds a twist many seem to miss: We humans seem to have an innate ability to separate into top dogs and bottom dogs and then brutalize each other. We'll do it over almost anything or even nothing. My second response to Bill's lyrics: Sometimes it's not all that hot in the big house on the hill. But you have to live there to find out. Ghostdance is so rich. So many moods and themes. Haunting melodies, driving beat. Bill sings a love song to his wife. So lovely. None of the "I gotta have you, Baby. I'll die if you leave" addictive garbage. Bill expresses feelings a person has when he or she's been with another for 20 years or more. The flow of time wears away the rough spots, the unevenness, the willfulness, leaving the smoothness of adaptation, acceptance. Forgiveness. Of having been through it all together and loving each other anyway. That's love, not the rubbing of two carefully constructed facades created to give the illusion of reality. The currency needed to buy an evening's pleasure. How to describe this rich gift called "Ghostdance"? Wonderful guitar. Great use of Native vocalizations. Thoughtful lyrics. "Where are we going?" Bill asks in the song,"Ghostdance." My meditation teacher wrote a book by that name. Bill sounds like a yogi time and time again. A mighty warrior coming home. We are mighty warriors coming home. When I really like something, I find myself (1) pulled into meditation or (2) wanting to ride my horse. Sometimes both, which is risky, depending if I'm on an actual horse. Well, Bill hit the jackpot. I was listening to the CD a few dozen times to see if I had any more reactions that should be included here. I found myself in the "both" category above, my mind dead stopped except for the desire to saddle up. 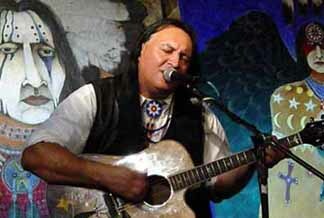 The same thing happened when I listened to Robert Mirabal's new album, Mirabal. If any of you readers are riders of Peruvian Paso horses, there's some good riding music in Ghostdance. I bet it holds some nice Musical Exercise Class ribbons for a good horse and rider duo. 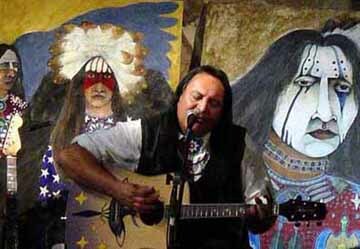 (If you go to Robert Mirabal, I explain what the Musical Exercise Class is, including a picture of a horse that's never been beaten in it.) I bet you could teach your horse some pretty fancy moves to Ghostdance. Any takers? Shawna? Jorge? Dante? Huh? As a final testimonial to Ghostdance, I had the good fortune to acquire two fabulous CD's within 24 hours: Ghostdance and Sudama. (For more about Sudama, click here: Sudama and Dreamtime Continuum.) Sudama is by a very good friend, Mark (Sudama) Kennedy, who is the leader of a band called Dreamtime Continuum. Where Bill Miller's soul is flavored by his Native American experience, Mark Kennedy leans East-- way East to India and Japan. And not so far East--to the Middle East. Also West. To California. And to Europe. Mark's all over the globe. That's what happens when your dad's a diplomat. The two CD's couldn't be more different in feeling and sound. They capture the essences of two very different men perfectly. And two very similar men. Both are immensely spiritual. Their work shows the same honesty, same purity of expression. Both are beautiful and multi-layered. I feel Ghostdance like a flow of boiling, red lava. Sudama seems an elegant puzzle seducing me into following the singer. Both have a message that drops the listener to his purest depths, elevates to the heights. I love both albums. So what's the testimonial? I had a stack of each CD in front of me last night, wrapping them as gifts. I listened to Ghostdance for the umpteenth time while I wrapped. Ghostdance just grabbed me up. Swept me into its flow. I wasn't aware of what I was doing. Wrapping away. Writing names on colorful paper. Losing it completely. I don't know whose album I gave to whom. Did I give the boiling Ghostdance to my elderly Auntie Elma? Did my son get the mellow Sudama? Will my mother rock to Bill's beat, while my nephew Nano-- who went with me to see Bill in the Halloween Edition below---gets Mark Kennedy's meditative treat? Who knows? I really went out. I don't care, either. I'm too shot by the Holiday madness to unwrap anything and check. They'll deal with it. Both CD's are terrific. That's it! Best wishes to you from me, Sandy Nathan, and the entire Nathan family. May you have a Holiday Season and lifetime surpassing your wildest dreams. May peace prevail on earth and all the warriors come home safely. Best wishes to you, Bill Miller, and your growing family. THIS APPLIES TO ALL HOLIDAY SEASONS! BEST WISHES FROM THE NATHAN FAMILY!! Copyright 2011 Sandy Nathan, All Rights Reserved. 11/31/98 This is the seventh and hopefully last version of this article I'll write. When I started writing, I intended to take an hour and knock out a couple of fun pages on Bill Miller. I'd add them to our Music Section and that would be that. But that wouldn't do justice to the impact Miller's work has had on my soul. What to do? Life provided a solution: I had plans to be in upstate New York during August for the international convention of an East Indian meditation school. Bill's webpage posted a couple of dates which were within long driving distance from the Ashram where I'd be staying. I'd never seen him live --why not go to one of the concerts and report on that? Great idea. The minute I decided to see Bill live, the universe moved to stop it. I was caught in a grinder: Something in me wanted, needed and was gonna see him that summer. And everything else conspired to keep that from happening. I hated this. Further, after finally seeing the concert, I kept writing draft after draft after draft of this piece. None were right. Funny, but too shallow. Extremely deep, but too much. And all this weird stuff kept happening, which I thought was beside the point, but just yesterday realized was the point. The segment of my life called "writing about Bill" has been so bizarre, that I wanted to share it in some detail. And here it is: Halloween. What a coincidence! Trick or treat!? Before we go farther, some readers may wonder who Bill Miller is. I certainly didn't know two years ago. 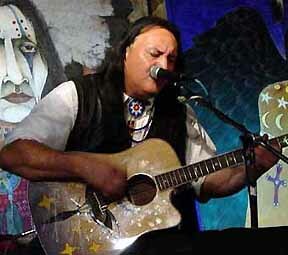 Bill is a Native American singer/musician raised on a reservation in Wisconsin. I discovered him accidentally, picking through a basket of CD's at a local western store. Miller's music knocked me flat. It dropped me to depths of feeling that I needed to reach, but had been unable to access. 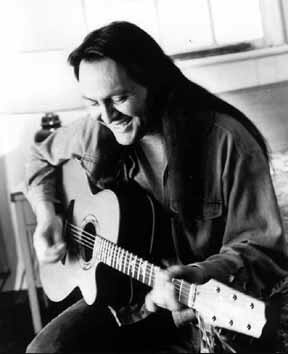 I went out and bought everything of his I could find after purchasing that first CD, "The Red Road." Bill Miller's other work had the same effect. I owed him a debt of gratitude for the personal growth I achieved by CD alone. Also by way of introduction, why is this story my Halloween treat? Because it's spooky... and tricky.... and strange. Have you heard of the Trickster? Many Native American spiritual systems incorporate a Trickster. He is a spiritual entity who does exactly what his name implies: Plays tricks on people. Usually gentle little tricks that get you moving. The Trickster appears in some European folk mythologies. In yoga, we have Ganesh, the deity who removes obstacles to the spiritual path. Ganesh is a fun loving, chubby dude with an elephant's head. He likes to play. Sometimes he plays by removing obstacles, sometimes by putting them in your way. He yanks your chain, in other words. One asks Ganesh's blessing for any new undertaking. I must have forgotten when I went to see Bill Miller. In the spirit of Halloween, I'm offering this tale of Ganesh, the Trickster and obstacles on the path. All this really happened. Okay, I was going to be in an Ashram, a Yogic monastery, outside a small (very small) town in upstate New York in July and August. Bill's website said he'd be playing in Bethlehem, PA and Boston, MA, while I was in New York. Bethlehem was a 2 hour drive from where I'd be, Boston, about 5. Obviously, Bethlehem was closer. So I called up the venue to check it out. I was nervous. I'm a grandmother, don't travel alone much. Don't like the East Coast or anywhere outside the state of California, really. I don't drink, go to bars, etc. Didn't want to go anyplace like that. I also wondered why I wanted to go so much. Was this overwhelming desire to hear Bill Miller symptomatic of some deep-seated psychological imbalance? In short, I was having a major anxiety attack. I called and called and called. The city of Bethlehem, PA, was busy for almost 2 weeks. Not just the place where Bill was supposed to play-- The whole town. Every time I'd call, the computer-generated operator said, "I'm sorry. All our circuits are busy. Try again later." I kept calling. How can a whole city be busy? Surely, someone would hang up so I could get through! I finally called Bethlehem information. Maybe the number was wrong on the website. The operator said the venue didn't exist--in Bethlehem or anywhere nearby. I got through to Bill's Boston venue on the first call. The Chairwoman of the Board of Directors picked up the phone. Happened to be walking by when I called. We had a lovely chat. The Club Passim is a non-drinking, nonsmoking Middle Eastern club appropriate for grandmothers. Perfect. (This is called "synchronicity", a term invented by Swiss psychologist Carl Jung to describe eerie coincidences. As when unrelated events that mean something come together out of nowhere.) "Guess I'm supposed to go to Boston." But there was no easy public transportation to Boston from South Fallsburg, New York. I knew if I tried to drive five hours on roads I didn't know on the utterly alien East Coast, my bad back would act up. They'd find me midway to Boston the next day, unable to get out of the car. I'd be transported to the nearest hospital, where I would end my days in traction. Then there was the problem of company. I didn't want to go alone. The only people I knew in Boston, my brother and sister-in-law, would be in Chicago at the National Ironman and Woman Championships. Not something they do every weekend, just that one. As if by magic, the barriers dissolved. I was going to see Bill after all! Getting there involved cars and planes, but no buses or trains. The trip would cost only slightly less than the National Debt-- it was my birthday present from my husband. "See Bill Day" was August 5th, 1998. As if by magic, my back went out August 3rd. I'd spent ten fantastic, miraculous, significant--in-every-way days at our Ashram with my older daughter. We had a blast! The Courses we took were wonderful. The Global Conference-- 1,200 leaders from meditation centers all over the world-- was stupendous. The people were great, the food, all of it-- was wonderful. So wonderful that my back told me to stop having so much fun. I didn't know if I could stand up, much less go anywhere. August 5th dawned. Voila! Back was great. No barriers to my big adventure. Everything's cool. Except that when my back was hurting, I couldn't get any money to pay the driver who would take me on lap one of the great race. He was "cash only." I had money, but it was in California. And all the ATM's in the tiny town (2) were broken. Why that day? I gave my daughter all the money I had (a twenty) so she could eat and said, "Mooch off our friends if you need more." I told the driver my plight. He wasn't too worried. There was another ATM just out of town. It didn't take my card. The fewer and farther between banks after that wouldn't take my check. The driver-- a really nice guy, a bit nervous, though-- was getting hysterical when the last bank managed to cough up enough for me to pay him. Was this fun? No. Right there, I thought, "Ganesh." The Trickster! Nothing to do but see how it turned out. Other people would have started swearing. The driver wanted to. Especially when the State of New York's Highway Department routed all the New York bound traffic on our side of the freeway onto the frontage road. That included us. The frontage road! The driver was so upset he could hardly speak. He'd just driven the freeway in the other direction to get me. "They weren't doing this two hours ago." There we were, stalled on a frontage road, crawling through tiny hamlets no one had ever seen. For miles. Meanwhile, the freeway was empty. Even of road equipment: They weren't working on it. No one was doing anything on the freeway, but they diverted the traffic. Why? Even Caltrans doesn't do stuff that stupid in California. I relaxed. We'd either get to La Guardia in time for my plane, or not. We'd allowed 2 extra hours for the drive. I got there just in time to walk on my plane. Ganesh was having a field day. My nephew picked me up in Boston on schedule, having changed his flight to Chicago to see his sister compete for the National Ironwoman title so he could see Bill with me. In due course, I found myself standing on the steps leading down to a basement to Club Passim, where Bill Miller would play. Club Passim is literally underground, in the middle of bustling Harvard Square. (Yes, the Harvard.) I was pretty crabby by then, having missed lunch in addition to everything else. My nephew, Nathan Fisher (Code name: "Nano" to family members) and I got to the Club at 7, when it was supposed to open, but didn't. Nano and I stood in line with other fans. One brought a suitcase. Would we have to wait that long? We were not having fun. Nano made a few excursions from our place in line, one to buy a throwaway camera, on the off chance that I might be able to photograph Bill. Failure. He left again to get us Snapples. Juice. Anything. More failure. Still we waited. I found it hard being in the world after a week of deep meditation. My heart kept exploding with light. Colors were too bright. Things went too fast. After all I'd gone through to get there, I didn't want to be where I was. One plus was the fact that we arrived about the same time as Bill Miller. A vehicle pulled up in the alley and a guy with long black hair got out. I figured it had to be Miller because he looked just like the guy on Bill's CD's. A pretty good clue. He kept walking past me down the steps down to the Club, bringing in guitars and so on, confirming my suspicion that he was, indeed, the Real Bill. I gawked, unable to open my mouth and say, "Hi. I'm Sandy Nathan. I'm featuring you on my website magazine. I clawed my way from South Fallsburg to see you. Can we talk?" I have a hysterically reverent fascination with prominent people, coupled with geeklike terror. If I get near anyone even mildly well-known, I usually stare worshipfully and then stammer something like, "Uh... Nice shoes." I'd had plenty of chance to look at my problem with the Distinguished at the Ashram. A couple of very well known celebrities were there. I made them so awkward that one took a vow of silence. The evening wasn't shaping up the way I thought. Nothing was magical. I'd invited some folks from the local meditation center. No one showed. By the time we got into the Passim, my blood sugar level was down around my ankles. The Club looked like a dingy cellar with bunch of tiny tables stuffed into it. Tables that quickly filled with weird people. From the crowd, lots of folks liked Bill Miller as much as me. Dinner elevated my mood nicely. I looked around. The Club Passim was transformed into charming, hip place, jammed with nice people. Wow. This was an historic place. Joan Baez sang here, years ago. Wow. She lived around the corner from me when we lived in Woodside. I used to follow her in the grocery store, genuflecting and drooling. I'm stalling. I'm scared. I don't know if I'm capable of describing the emotional impact of hearing Bill Miller in that intimate setting. I don't know if I can put across the feeling he created in that room. I absolutely don't. At one point, I looked around at the crowd and saw upturned faces, people with their eyes closed, expressions rapt. Deep inside themselves, listening with their hearts. Bill's music is deep. Penetrating. Utterly moving. I found myself drifting into meditation, unable to stop myself, hands forming yogic positions involuntarily. This was what I came for. This was what attracted me. I looked at Bill's face as he sang. His eyes were closed, the light bathing his features. His soul was there, singing the song, letting it come through him. I let myself be in my inner world with the other people in the room. It's a place I know well, one I usually confine to the meditation hall, far from the world. I understood why everyone had come to hear Bill, and what had pulled me so powerfully. As the evening unfolded, I learned why I was there, why I'd surmounted all obstacles. I slipped easily into memories of the week before, memories of the Global Conference I attended with other leaders of our meditation school. I saw the face of another fine and passionate man, Professor Douglas Brooks. 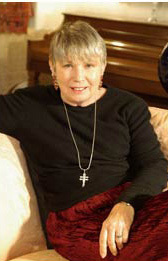 Dr. Brooks is a Professor of Religious Studies at the University of Rochester in New York. As I listened to Bill Miller sing, I recalled Douglas Brooks standing before the vast crowd in the meditation hall, quoting the work of a 13th century Indian poet/saint. I couldn't move for the wonder. What words were these? As I listened to Dr. Brooks, it seemed that someone poured opalescent blue liquid into my ears. I could see its color and shimmer. The liquid merged inside me, forming a lake of blue delight. Of incredible beauty. I couldn't move. The lake became an ocean, shimmering, pearl-like. I could feel its power, hear its roar. I didn't feel the tears running down my face. I didn't know I was crying until I heard my own sobs. I have never heard such beautiful language. I have never heard such beautiful words. I slid into a deep meditation. Douglas Brooks stood at the podium, quoting the poet, face lit by his passion for learning, his passion for the Word. The Light. What did the Professor talk about? The Nataraj. The Dancing Shiva. I'm sure you've seen it: A dancing figure in a hoop of flames. The Nataraj is one of the world's greatest religious symbols. The ancient poet described Shiva as he dances. The Nataraj. Shiva, the Lord of the Dance. Dreadlocks flying as he whirls in ecstasy. Shiva, dancing always and everywhere, the bliss of the Lord underlying reality. So huge He fills the entire universe. At the same time, smaller than the smallest particle. He moves to the cosmic rhythm, wildly expressing his joy. All the while, Shiva is still, as a champion skater executing the fastest move shows a thread of stillness. Shiva is impassioned, yet composed. Utterly real. Utterly authentic. Just who he is, with no pretense, no hiding. Primitive and primal-- and refined and elegant. Shiva, the real dancer in the dance of life, of which we are all a part. Where does this dance take place? Where did these words take me? To the madya. The Sanskrit word for the Center. The opening in the universe where God appears. To the space between the breaths. To the place where thoughts arise. The madya-- the crack between the fence boards that lets the garden on the other side peek through. We were in our deepest depths, the center of our being. Dancing with Shiva. That's where Bill Miler took me and many others in the Club Passim. I finally got why Bill Miller's work is so powerful. Bill sings from this center, the deepest part of any human being. His song resonates there, in the jeweled center of his heart. His voice strikes the identical chord in the hearts of his listeners. That pure chord is what attracted me to Bill's music and dragged me to Boston. What I already knew was revealed to me again. I heard that deep place of origin the first time I listened to "The Red Road". Professor Brooks' lecture gave me words to put around the experience. Well, I really liked the concert. Bill and Clint played many of the songs you can hear on his CD's. They played fast. They played slow. Bill pulled out the assortment of flutes he had stashed on a chair and played them wonderfully. The whole thing was amazing. They also played some songs from Bill's upcoming CD, Ghostdance, which were excellent. Throughout, Bill talked. He's very talkative. Almost as talkative as me. All I can say is-- go hear him live. Miller has a message that many ministers would die to possess and deliver the way he does. It is (in part): "We are all Native Americans now. We need to forgive and live in peace." When the concert was over, Bill and Clint disappeared down the aisle and into the Club Passim offices. People sat at their tables, savoring what they'd heard. The emotional state Bill left behind was full and rich. I felt very satisfied, though I'd hoped to say a few words to Bill and give him a tape I'd brought. Didn't seem possible-- until my nephew said, "Why don't you talk to the management?" Good idea. Why not ask? I did. Something extraordinary happened. A staff member went into the offices after my request to say hello to Bill. She came back saying, "He's really tired...." I whined a bit and she asked again. Bill came out, looking exhausted. A group of perhaps ten of us stood in the lobby chatting. Bill didn't know who I was-- this person who would be writing about him-- so he greeted everyone with as much warmth and compassion as he'd show his own mother. A contemporary Hindu saint said, "The truest religion is welcoming another human being with love." I saw a perfect example of this in Bill Miller greeting a pack of strangers. I bet he never heard of that Hindu guy, either! Eventually, Bill got around to me and I had my few words. Gave him the tape. Told him how much I enjoyed his singing and that I'd have some very nice things to say about him. That was it. My nephew and I climbed from the Passim into the human circus of Harvard Square after dark. Blue haired, pierced people groped each other in doorways. We moved through narrow streets rimmed by tall brick buildings and sloping slate. The velvet sky enveloped us. Stars, holes that let the light shine through, showered a sweet reality. What a lovely night to be alive. Thank you, Bill Miller, for singing your song. Thank you for inspiring mine. That was the concert. I went back to the Ashram, thinking I'd write a review and that would be it. That wasn't it. I'm not the writer of my life, nor the writer of the play around me. Things happened. Issues I've grappled with all my life flamed: What is the nature of evil? What is the nature of good? Why would a loving God permit this? 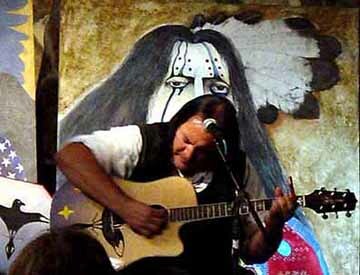 In the midst of this, I began to write about Bill Miller's gig. What came out was not a two bit write up of a concert, but a philosophical inquiry about good and evil set in Bill's show, wrapped around things he said. Like, "I don't understand how people can do things like that to other people," referring to atrocities at the massacre at Wounded Knee. I put together a very clear and compelling explanation of exactly how people can do that, based on psychoanalytical and psychological theory, clinical research and my own experience. Neatly written so that almost anyone could relate to it Also, entertaining and even funny, in parts. Then I went on to examine goodness and its source, much more interesting topics. The piece was neat, if I do say so. I got it about 7/8 done, thinking, "This is nice, but what do I do with it?" It stood at about 70 pages. Funny, useful, insightful pages. Well written. I intended it for the Internet. How could this monster go on the net? Obviously, it was too long. So I thought, "Why don't you publish it (with Bill's permission), sell it, and donate the proceeds to some Native American charity?" I talked to a few people about it, who thought this wasn't too silly an idea. Maybe even a good one. Meanwhile, the oaks and vineyards issue came up (Oaks and Vineyards) and I had to write about it before the election. Ideas for a section of a book I'm writing flooded in: I got busy. I shelved the "publish and donate" idea and the Bill Miller piece until yesterday. I pulled up my computer files, getting ready to put this essay on the net-- and everything I wrote about Bill was gone. Yes, gone. Gone from my hard drive, gone from my floppies. Gone from the ZIP disks. Gone. No one in my house would erase it. The stuff was just gone. I managed to find the few pages about the concert on an old floppy I'd started when I was at the Ashram. Just the part I intended to put on the net was left. I accepted it pretty well. Seventy pages of work that I sweat blood on was gone. With no explanation. But it was weird! I don't lose things. "Hum," I thought. "Maybe I got what I was supposed to from the writing about good and evil. Maybe it wasn't supposed to be shared. Maybe this is just another little joke." And, "Why is this happening to me?" Ganesh. So, today, I fired up my computer. My hands sort of did what they wanted to. I opened up some obscure files, seldom used, and there was the Good and Evil piece, happily saved. Was it "just a mistake"? Did I "just forget?" Or did Ganesh yank my chain? Whatever it was, it got my attention. I realized this story wanted to be written. So I did. Happy Halloween, everyone! Don't let the Trickster get you! PS Bill, does stuff like this happen around you a lot? "BILL GATES MEETS DON JUAN." BORN PREMATURELY ON A FREEZING NIGHT, THE COLT HAD TO FIGHT FOR HIS LIFE. Click the covers above to go Sandy Nathan's books on the Amazon Kindle store. All Kindle books are 99 cents. They are also available as print books at Amazon. The Angel and Numenon are also at the Nook store. The Angel is an iBook, as well. AUTHOR SANDY NATHAN IS THE WINNER OF FOURTEEN NATIONAL AWARDS!